In this letter to a new student, Rinpoche advised how to practice effortful meditation according to the three scopes or levels of practice. For you, the main lamrim text to study is Lama Tsongkhapa’s Middle Lamrim. Study this text three times from beginning to end. When reading, it’s not like a puja. When you read the text, reflect on the subject by thinking about it and in this way it becomes a meditation. 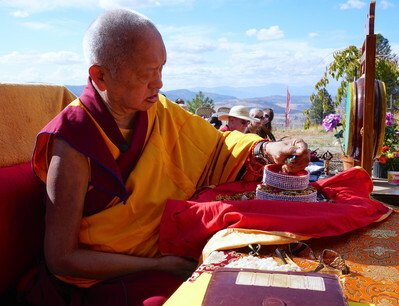 Take notes on any subjects which are difficult to understand and discuss later on with an old student or a geshe. When marking the book, for example, with a highlighter, do that in a respectful way with a colored pen not a black pen, because it’s like offering robes to a holy object or like painting a thangka. Practice this cycle for the number of months specified for each section, completing the whole outline five times altogether. Then start effortless meditation until you see that one guru is all the buddhas and all the buddhas are the guru, mixed, just one. When you have very stable realization for weeks and years, then you will able to correctly devote to the guru. If possible, on the same day always do one meditation on the graduated path of the lower capable being. Before, this life's happiness was most important and the next life's happiness was not important. Everything was done for this life, but through meditation you can change your mind. Then this life’s happiness is not very important and the next life's happiness is most important. All your efforts go for the happiness of your future lives. This means that you have renounced this life, more or less, by meditating on the perfect human rebirth up to karma. Seeing that samsara is in the nature of suffering and it is like being in the center of a fire, what you need is liberation from its cause and to reach the everlasting happiness. By realizing that the self-cherishing thought opens the door to all problems and obstacles, and cherishing others opens the door to all happiness, you must practice Dharma. You must totally change those two from how you were before. You previously acted with the self-cherishing thought, whereas now you are only cherishing others, not the self. Also, the extensive way is thinking of the kindness of sentient beings, and then generating bodhicitta. There are also the seven points of cause and effect in order to generate bodhicitta—looking at other sentient beings who are suffering as yourself and generating infinite compassion for all sentient beings, and from there generating bodhicitta. Thus, whenever you see sentient beings, naturally you have the thought to achieve enlightenment for them. Like that, without effort realization of bodhicitta comes. Regarding emptiness, when you see the I, action and object as merely labeled by the mind, you realize emptiness, tong pa nyi. When you see emptiness unified with depending arising—that those two are unified, complementing each other—this is the complete realization of emptiness, the pure view of Buddha Shakyamuni, Padmasambhava, Lama Tsongkhapa and Milarepa. Vajrasattva: 50,000 mantras. These can be done either on retreat or in a loose way with daily sessions morning and night. Chanting the Names of Manjushri (Arya Manjushri Nama Samgiti) Recite this prayer three times. This is an incredible purification and accumulation of merit for you.